Begin in mountain pose (tadasana) with hands in prayer. Shift your weight onto your right foot, and slowly lift your left foot off the ground. Place the left foot against the right leg: against the thigh or against the calf, but not against the knee. If you feel wobbly, it’s okay to place the left foot at the right ankle and rest your toes on the floor for stability. Press your left knee out to the side. Let your gaze rest on an unmoving spot in front of you. When you feel steady, you can lift your arms up. Slowly lower your arms down and your left leg to the floor. Shake out your legs. Tree pose improves balance. It also works the muscles in both the standing leg and the bent leg, as well as in the arms if arms are extended overhead. Can be beneficial for those with sciatica and flat feet. 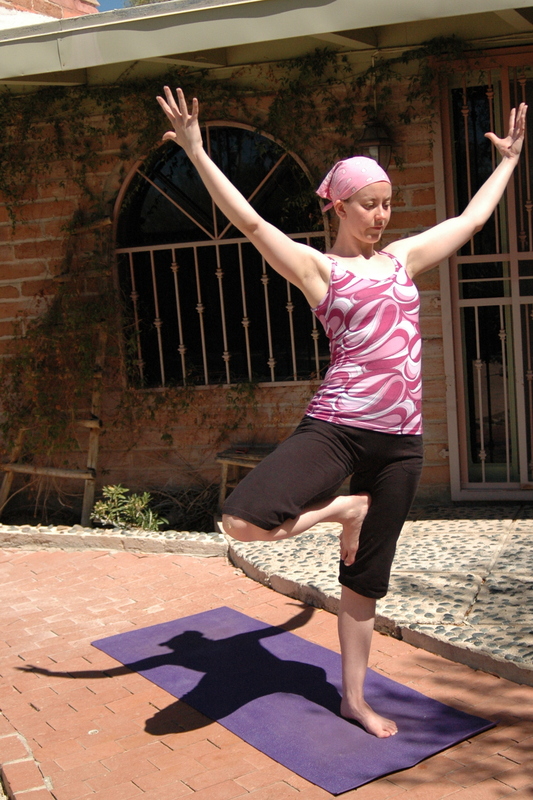 People with balance disorders should take care and practice tree pose near a wall for stability and support. Headache and low blood pressure are also contraindications. Those with high blood pressure should not raise the arms overhead. I love tree pose for several reasons. It’s a pose that I can do well, and it feels good to do the pose. At the same time, tree pose is always challenging, depending on what my balance is like on that particular day. In tree pose, I have to rely on both physical and mental balance, and if either are off that day, it makes the pose more difficult. However, when I am physically and mentally balanced, I get into tree pose and feel like I can stay there all day. I love how practicing tree pose makes me focus my mind. It’s a pose that always makes me feel peaceful and centered, balanced and strong.